Our stunning garden obelisks and trellis will provide support for climbing plants and will make a statement in any garden. Choose from our range of pressure treated obelisks and don't miss our best-selling Zest4Leisure Snowdon obelisk and create a stunning display in your garden by supporting some climbing plants. 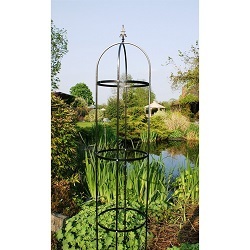 Also in our range are the Grange garden trellis obelisk and the beautiful metal Poppy Forge plant supports and arches.